We've decorated for Christmas! We might still try some outdoor lights, but the indoors is about as decorated as it will get, short of all the gifts being wrapped and under the tree! It takes us about an hour to deco. We have a small artificial tree that we just pull out of a garbage bag, with the lights still on from year to year. 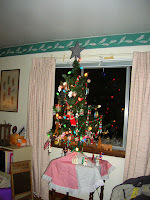 Then we put as many ornaments as can possibly fit on (hanging 2-4 per branch and some from the bead garland, too). We put Christmas music on the computer, decorate the tree, and then Simon, the self-proclaimed "crazed 14-year-old decorator" ran around the house hanging miscellaneous decorations wherever there's a place to hang something (ornaments on the lamps, etc). 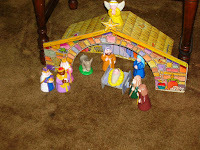 He also set up all the nativity sets (I have several - I sorta collect them). 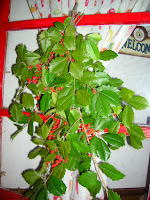 I did hang some holly boughs on each of our doors, though, as our outdoor decos. It looks pretty, but the ugly, dirty screen doors sorta dull the effect. Today we went to a banquet for Simon to be awarded his special bolo for leadership training. Actually, it wasn't just going through the week of training in August, but to earn the bolo, the boys needed to set some high goals back then, and meet them (and have leaders sign off) by the end of October (or something like that). I'm very proud of him for doing all of that! His goal was to work with his Bible Study leader to increase attendance at their gatherings, and he did! Don't you just love handsome men in uniform?